You are here: Home / How to / What KPIs should I use? 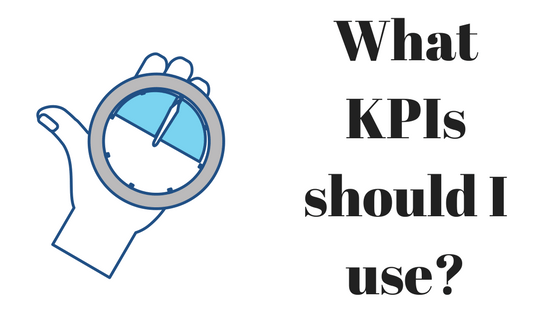 A question that I regularly get asked by business owners is “what KPIs should I use?”. Most business owners are familiar with the idea of KPIs and they understand that they should have them but they are not sure where to start. I have been working in management for over 20 years now – initially as an employee and in recent years as a business advisor. My focus is on helping business owners improve their profits. I have worked on many lean projects both as leader and as team member. 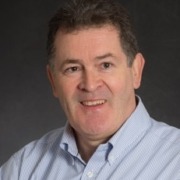 I am an approved Lean Advisor for Enterprise Ireland and have helped many SMEs implement Lean initiatives. In almost all of those improvement projects, I helped the business owners to select their KPIs. Let me tell you how I approach this task. KPI stands for Key Performance Indicators. They are quantifiable measurements, agreed upfront, that monitor the critical success factors for a business. A well-managed business will have a clear vision of where it wants to be in the future. Critical Success Factors are the building blocks that will enable the business to realise its vision. The KPIs are those measures which provide feedback on whether or not the CSFs are being achieved. For example, a business decides that it needs new products to satisfy market needs. Possible KPIs could be number of new products launched in a period or proportion of revenue generated from new products. It is important to understand the difference between CSFs and KPIs. The CSFs tell you what must be done for the business to be successful. The KPIs tell you if those CSFs are being achieved. I tend to think of KPIs as success criteria. If I ask you how you will know if something is successful, you will tell me what needs to be checked to find the answer. The KPIs provide evidence of success or lack of success. We are all familiar with the phrase “what gets measured, gets done”. Measuring something puts focus on it and gives you an objective way of determining if progress is being made. KPIs are a key part of the visioning process. If you don’t measure your KPIs, then you are less likely to realise your vision. They provide focus and direction. Using a phrase from the Lean Approach, KPIs are a voice of the business processes – they are the feedback from the processes. They can be used to compare and assess your business, your processes and the performance of your team. I think of them as the Vital Signs of your business. They provide an early warning system for your business. 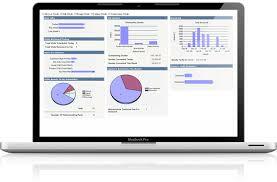 Many people refer to them as the components of the dashboard for your business. What characteristics should KPIs have? We need to have hard data. We prefer not to have to rely on subjectivity or individual assessments. It must be possible to quantify the things that we are measuring. We want to be able to represent the results graphically. If we can graph something we can see it. Everyone involved in the business should be able to understand what we are measuring and why. To achieve that we must keep things simple. I find it useful to think of KPIs as coming from two different perspectives. From the definition above, you may be tempted to focus on improvement and development initiatives. That’s fine. These initiatives are likely to be key building blocks for getting to where you want to get to. However, you must also take care of the day to day business. If you don’t maintain profitability, you may not survive to reach your desired destination. For that reason, I encourage clients to think in terms of Maintenance KPIs and Development KPIs. When selecting KPIs its very useful to think in terms of processes. In doing that, simple process maps can be very helpful. Begin by identifying the starting position. Then you move on to identify the key activities or operations that must be completed to bring you to your destination, the finishing position. Some people just focus on the end point – the result. If you have a project or process that will take time to complete, then you should be looking at interim measures that will let you know if you are on track. Think in terms of predictor measures as well as result measures. For example, lets assume that you sell a complex product and you know from experience that 20% of prospects will ask for a quote and of those quotes 25% will result in actual sales. Let’s say that the product sells for 100K and you need to sell 20 this year. We can deduce that we need to generate 80 quotes to make 20 sales. We also know that we need to be talking with 400 prospects to achieve 80 quotes ie 20% of prospects. You should consider having a KPI for the number of prospects identified and another for the number of quotes generated. The number of prospects identified should be a good predictor of your sales. Most people accept that the average person can only focus on seven plus or minus two items at any point in time. Practically this means that our set of KPIs will ideally number 7 +/- 2 ie 5 to 9. For a total business then we should identify the 5-9 KPIs that will provide a good test of whether or not the business is on track to realise its vision. However, we can also chunk that down to departments or processes and we can identify 5-9 KPIs for each department or process. In a management team then we will have 5-9 overall KPIs. But each member of the management team should have 5-9 KPIs for the areas that they are responsible for. We can cascade this all the way down to the lowest level process and have KPIs for each process. We should end up with KPIs for the overall business supported by KPIs for each department and for each critical development process and these will in turn be supported by fundamental processes. So we have had enough theory, lets see how that could work in practice. Firstly, I ask clients to create a vision of where they want to get to. For every business this is different. It may involve products or markets or profitability or use of technology. I challenge them to create a picture that will represent where they want to get to. Once we know where they want to get to, I ask them to identify the building blocks. What has to happen first for them to achieve their vision. For each of the building blocks, I want them to create a simple project plan – what has to happen, who is responsible for that and when must it be complete. This project plan will provide me with KPI candidates. Additionally, I ask them to identify the key processes in their business. This usually includes a marketing process, a sales process, a production or operations process, finance processes and other admin processes. I ask them to map out the processes and identify the key measurement points in each process. We don’t want to just wait for the finish point – we want to be able to test within the process to ensure that each process is on track to deliver. You are likely to have come up with a list of many KPIs. You now need to prioritise these so that you can identify a small number (5-9) of driver KPIs. Ask yourself which of the candidate KPIs are most likely to help you get the business to where you want it to go. Once you have your KPIs identified you should document them. What are you measuring? Who will measure? What exactly will be measured? How will they be measured? Where will the results be posted? Who will keep the measurements updated? There should be no ambiguity. If a key employee is hit by the proverbial bus, then there should be clear guidance available for someone else to step in and keep the KPI measurements up to date. Publishing the KPIs is very important. This makes the priorities of the business very clear to everyone. In traditional businesses, the measures – often in graphical format – will be posted on a white board in a location where everyone will be able to see. In newer businesses, they can be published electronically – possibly by email, on a shared folder, on an internal website. Sometimes businesses will run a powerpoint on a tv or monitor in an area where everyone can see them. Once you work through and identify your KPIs, don’t assume that they will not change. Every so often, you should be updating your business vision. When that happens you are likely to identify new CSFs and in turn you will have to identify new KPIs. There tends to be more consistency about the maintenance KPIs. But even there, if a business is going through a wobbly patch, they may want to edit the KPIs to prioritise something new. Say for example, that you have found a problem with incoming raw materials in recent weeks. You may decide to test incoming quality for a while until the incoming quality is restored to the standard that you expect. The incoming quality test could be added to the list of KPIs until you are satisfied that the problem has been permanently resolved. If you want to use your accounts strategically, then you should organise your accounts so that, where possible, information regarding KPIs is highlighted and readily available. For example, a professional services client told me that he had set a goal of increasing his retainer fee income to being 50% of his total fee income. A KPI for him then should be the percentage of fee income revenue over total revenue. At that point, he was not distinguishing his retainer fee income from other income. However, his accounting systems were well capable of doing that. So, we created some new fee categories for him. Now when he runs his profit and loss, his fee income is already analysed by the various categories and he doesn’t to do any further work to get his key meaurement. By making the KPIs so visible it really emphasised it and he reached his 50% target much faster than he expected to. With well-selected KPIs you have put in place a mechanism to let you know when you are not meeting your targets. Once you know that you are not meeting a target – either maintenance or development – you know you need to improve. The KPIs are identifying an improvement opportunity for you. You should immediately initiate an improvement project to bring the KPI back to where it should be. A manufacturing company that had an aging product line with one major, and several minor customers, was looking to identify its KPIs. They decided that they needed to develop some new products and to find some new customers so that they were less dependant on one major customer. They also identified that their product costs were high compared to their competitors. A drinks distribution company had very healthy market share and profitability. However, they detected a trend towards people buying in off-licences for home drinking. Their share of the off-licence business was small so they set a goal of increasing the % of their sales to off-licences. However, they were disappointed in the progress that they were making towards that goal. They reviewed what they were doing and realised that the main KPI for sales people was € value of overall sales. What was happening was that sales people knew that the best way of hitting their sales targets was to sell big orders to chains and supermarkets but not to the target independent off-licenses. So they changed the KPIs for Sales People so that Sales % to off-licences became more important. Immediately a shift was noticed and within one year, they were close to achieving their target. For your business, your KPIs are like the dash of your car. You need to decide what you want to achieve and how you will do that. Then you put in place KPIs that will measure progress towards your goals while also ensuring that your existing business processes continue to perform well. It main take a bit of time to explore and finalise your KPIs. Realise that this time should be viewed as an investment in realising your vision. If you have any questions about this article, feel free to contact me. If you would like to have a discussion about KPIs let me know. I would be delighted to help.